Showcasing artists from more than 65 countries, SXSW Conference and Festivals offer 10 days of opportunities for visitors, industry attendees and locals to expand their music repertoires. While the SXSW Music Festival showcases 2,000+ artists (560+ of which are international), here are 10 of the many amazing acts that call Austin, the Live Music Capital of the World®, home. Be sure to buy your passes for the festival and explore the full schedule, spanning March 8-17, 2019. Golden Dawn Arkestra. Credit Joseph Riggs. Abhi the Nomad had a big year in 2018 with the release of his first album, "Marbled," which was named Austin’s Album of the Year by The Austin Chronicle. Having lived in more than 25 different places, he settled on Austin as the place to bridge his indie rock sound with melodic hip hop beats. His blend of the two genres is one you’ll want to hear live. A favorite among Austinites, Tameca Jones brings soulful R&B vocals to SXSW every time she performs. She was recently named Best Female Vocalist at the 2018 Austin Music Awards and is expected to release a new EP in March. Since 2011, Wood & Wire has been touring and playing festivals, spreading their Americana bluegrass sound across the country. Their hard work has clearly paid off and, at the end of 2018, Wood & Wire received a Grammy nomination in the category of Best Bluegrass Album for their LP, "North of Despair." Often described as "psychedelic soul music," Kalu and The Electric Joint bring a completely unique sound to Austin. Frontman Kalu James blends his appreciation for ancient African rhythms with guitarist JT Holt’s bluesy soul to create their distinct sound. Their first album, "Time Undone," tells a great story through their lyrics and rhythms. Returning for their second official appearance at SXSW this year, Blushing’s dreamy rock shoegaze sound is really taking off. The two couples have had Austinites mesmerized since 2015 with both their videos and live performances. They are expected to release a new album in early 2019. Also referred to as the "Texas Piano Man," Robert Ellis brings together bluegrass and folk, creating a homegrown alt-country sound. After debuting his most recent album, "Texas Piano Man," in February 2019, Ellis is sure to provide an engaging show full of beautifully twangy vocals. And, if you’re lucky, he’ll perform his ode to Topo Chico, arguably Austin’s favorite beverage. 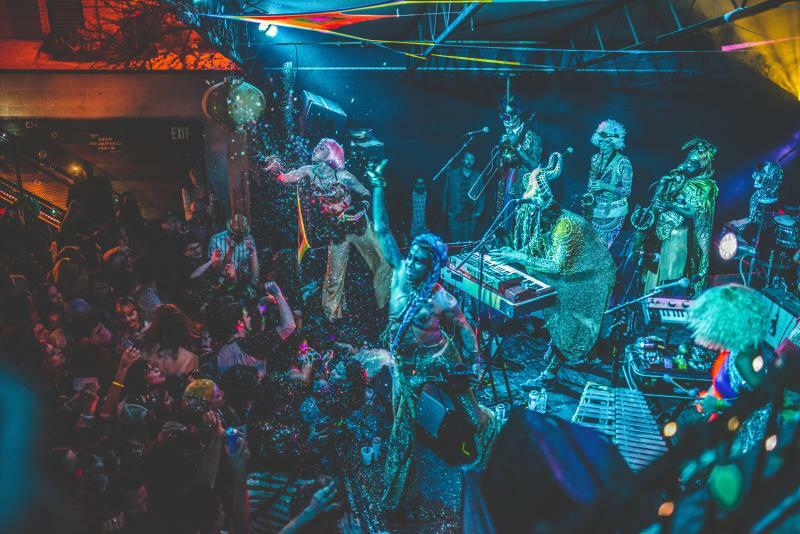 Any performance by Golden Dawn Arkestra is a spiritual and eclectic one, which makes us all the more excited for what they have prepared for this year&apos;s SXSW. Sporting arguably the best costumes you’ll see all week, this tropical funk group is sure to deliver numerous hits, as they have for NPR Tiny Desk concerts and previous SXSW showcases. As the only musician to be inducted into the Austin Music Hall of Fame three times, Jon Dee Graham cannot be missed at this year’s SXSW. He is a former member of Austin’s first punk band, The Skunks as well as the True Believers. Most famous for his solo career, Graham is an Austin classic sure to provide a true taste of the Austin music scene. Often singing of love and loss, Night Glitter offers relatable and entrancing electronic dream pop for all listeners. Comprised of LouLou Ghelichkhani and John Michael Schoepf, who have both had previous musical careers, Night Glitter will surely captivate audiences at this year’s SXSW. The five members of Sun June offer calming ‘regret pop’ that is sure to entrance any listener. While the songs on their 2018 debut album, "Years," are slow and mellow, this isn’t to say they haven&apos;t had a bustling year. Sun June embarked on their first tour in 2018 with 50 dates. So, make sure to catch them when they are actually in Austin! For more local Austin musicians at SXSW 2019, check out our Music Austin Spotify channel and keep up with the latest happenings @MusicAustin! Contributed by Mara Techam, Visit Austin Music Marketing Intern.